Last Saturday was the annual retreat for the Pen Dragons calligraphy guild, and I was invited to demonstrate e*graphics to the group. What a fun session with a group of talented artisans who were up for learning a new way to repurpose their art. Everyone got to make the small demo project shown below (calligraphy by Lisa LeBlanc) and get a taste of the e*graphic experience. Contact me at the email provided on the “About” page if you have a group that would enjoy learning how to create a new art material and the many things you can create with it! 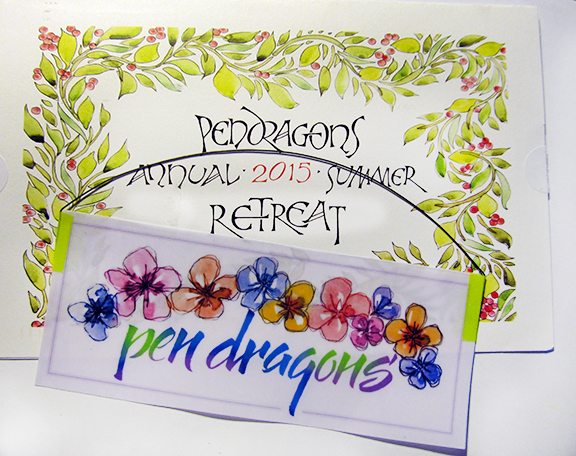 Invitation and demo project for the Pen Dragons’ 2015 Summer Retreat (calligraphy for invitation and the demonstration piece by Lisa LeBlanc).